In this Photoshop text effects tutorial, we're going to learn how to use Layer Styles to easily create a gel text effect. The great thing is that you can have lots of fun playing around with the Layer Style settings to create your own custom gel text effect, or if you prefer, you can use the settings I'm using in the tutorial. When we're done creating the effect, we're going to save it as a preset style which we can then apply to other text instantly, and at the end, we'll see how to change the color of the effect, which may not be quite as straightforward as you think. The final "gel text" result. Choose the Type tool from the Tools palette. With the Type tool selected, click on the text color swatch in the Options Bar. Choose a color for your text with Photoshop's Color Picker. Click OK once you've chosen a color to exit out of the Color Picker. Enter your text into the document. Use Free Transform to enlarge the text if needed. We're going to head into the wacky world of Layer Styles at this point, and the first Layer Style we're going to add to the text is a drop shadow. Before we continue, I just want to say again that you should feel free to experiment with the different settings we're using for this effect. You don't have to use the specific settings I'll be using. There's lots of wiggle room to play around with in creating this gel text effect. With the text layer selected, click on the "Layer Styles" icon at the bottom of the Layers palette. Select "Drop Shadow" from the list of Layer Styles. The Layer Style dialog box set to the Drop Shadow options in the middle column. Click on the Drop Shadow's color swatch to choose a color. Click anywhere on the text to sample the color. Select a different shade of the sampled color in the Color Picker to use for the drop shadow. 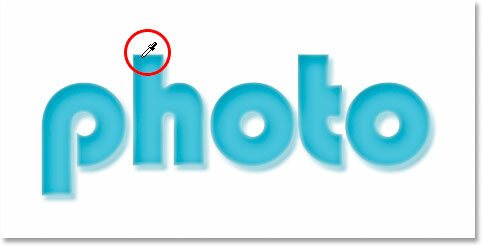 The drop shadow applied to the text using the color chosen in the Color Picker. Don't click OK in the Layer Style dialog box yet. We've only just begun. 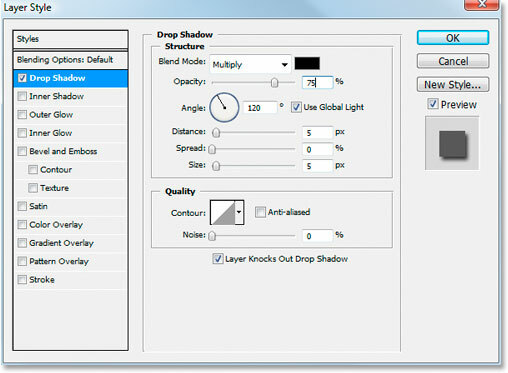 Click directly on the words "Inner Shadow" below "Drop Shadow" in the menu on the left of the Layer Style dialog box. Click on the Inner Style color swatch to choose a color. Click anywhere on the text once again to sample the color. 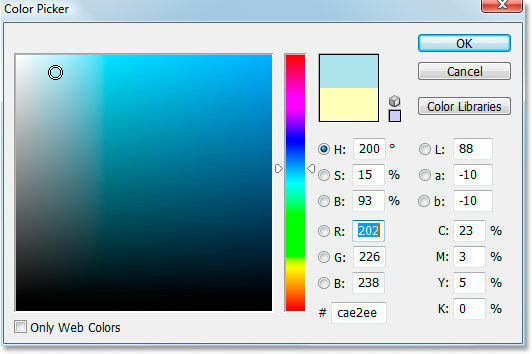 Select a different shade of the sampled color in the Color Picker to use for the inner shadow. The Inner Shadow is now applied to the text using the color selected. Increase the size of the Inner Shadow effect by dragging the "Size" slider to the right. The effect so far after increasing the Inner Shadow size to 16 pixels. Click directly on the words "Outer Glow" in the menu on the left of the Layer Style dialog box. 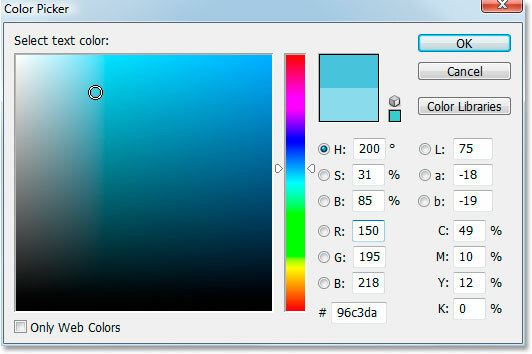 Click on the Outer Glow color swatch to choose a color. Choose a lighter shade of the text color this time to use for the Outer Glow effect. Click OK to exit out of the Color Picker. Make the changes circled in red above to the Outer Glow options. The effect so far after applying the "Outer Glow" layer style. Click directly on the words "Inner Glow" in the menu on the left of the Layer Style dialog box. 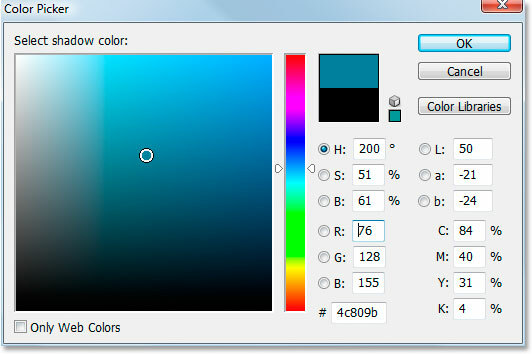 Click on the Inner Glow color swatch to choose a color. Click on a darker color in the text to sample it and use it for the Inner Glow effect. Click OK in the Color Picker to exit out of it once you've sampled your color. Click on the down-pointing arrow and change the blend mode for the Inner Glow effect to "Multiply". Change the options circled in red above for the Inner Glow. Again, feel free to experiment with those values on your own. The effect after applying the Inner Glow layer style. Click directly on the words "Bevel and Emboss" in the menu on the left of the Layer Style dialog box. Change the options circled in red above. First, I increased the Size to about 16 pixels. Then, in the "Shading" section, I unchecked Use Global Light, set the Angle to 90° and set the Altitude to 75°. Then, at the very bottom, I dragged the slider bar for the Shadow Mode option all the way to the left to set its value to 0%, since we already have more than enough shadows in the effect. Click directly on the word "Contour" in the left menu. Click the down-pointing arrow and select the "Half Round" contour, bottom row, far left. The effect after applying the "Bevel and Emboss" style. Click directly on the word "Satin" in the menu on the left of the Layer Style dialog box. Click the color swatch to choose a color for the Satin layer style. Click in a darker area of the text to sample that color to use with the Satin layer style. As soon as you click your mouse to sample a color, you'll see the Satin effect apply itself using that color. If you want, you can keep clicking around inside the text to choose a different color, and the Satin effect will be updated each time you click, so you can keep clicking until you find a dark shade you're happy with. It's basically a live preview of the effect. Change the Satin options circled in red above. In the case of the Satin effect, you're really going to want to experiment with these settings yourself, but for the sake of following along, first I changed the Angle to 75°. Then I increased the Distance to 43 pixels and the Size to 54 pixels. Finally, I clicked on the down-pointing arrow to the right of the Contour preview thumbnail and chose the Ring contour, which is the second one from the left, bottom row. The effect after applying the "Satin" style. Click the "New Style" button on the right. Photoshop's "New Style" dialog box. Name the new style "Gel effect". Then I'll click OK and I now have my style saved in Photoshop. Let's see how we can instantly apply it to something else. Photoshop's "Styles" palette with my saved "Gel effect" style at the bottom of the list of available preset styles. The "Gel effect" style is instantly applied to the new text. What if I wanted the word "shop" to be a different color though? It's easy to change the color, but there's a bit of a trick to it, as we'll see next. We're done creating the "gel" effect using layer styles, we've saved it as a new style named "Gel effect", and we've instantly applied it to the word "shop". But what if I want the word "shop" to be a different color? You're probably thinking "Easy, just use a Hue/Saturation adjustment layer". So let's try that and see if it works. The word "shop" is now pink after applying "Hue/Saturation". The word itself has turned pink, but do you see the problem? The layer styles are still blue. The Hue/Saturation adjustment had no effect on them. If we want to change both the text color and the layer styles color, we need to use a bit of a trick. Press "Ctrl+G" (Win) / "Command+G" (Mac) to place the "shop" layer into a Layer Group. With the Layer Group selected, change its blend mode from "Pass Through" to "Normal". With the "shop" layer selected, click on the "New Adjustment Layer" icon at the bottom of the Layers palette. 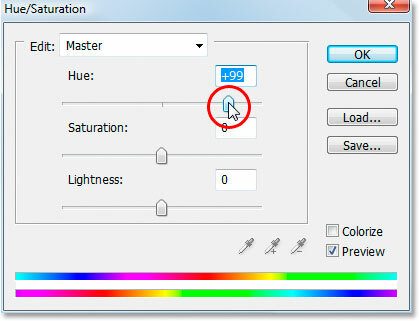 Select "Hue/Saturation" from the list of Adjustment Layers. Change the color of the text by dragging the "Hue" slider.